Safety and warning labels are designed to provide information regarding the risk associated with the use of a product, item, or system. These labels are attached to the item in question, and are characterized by bright colors, and particular safety or warning symbols. Safety labels can also be installed on walls or entrances, warning a person of safety hazards. Generally, warning labels are designed with a red, yellow, or orange background, with a triangle in the foreground. There is warning symbol designed inside the triangle. Safety labels come in different colors, shapes, and sizes, and are mainly used for commercial areas. The use of these signs is mandatory in industrial and commercial areas. Performance Label Company (PLC) provides a variety of safety and warning labels for commercial, office, and industrial customers. At PLC, we focus on providing custom safety labels. These can be designed according to a template, or according to the hazard level. 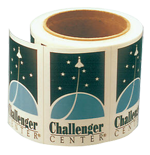 We manufacture the labels with durable materials and industrial grade adhesive. These ensure that the labels will adhere to the application surface, and remain clear and legible for long periods of time. Depending on the application, we design the labels in small, medium, and large sizes. However, irrespective of the size, we ensure that the following features are visible. The symbol is easily recognizable and quickly understood. Hazard statements are provided in detail. The safety actions are simple and concise. Eye-catching fonts and sentence cases are used. At PLC, we design our safety labels to peel off from the stack or roll easily. Our labels can be designed in any shape or size according to the client's requirements. We can manufacture them in different materials, including waterproof materials for water prone areas. The labels are manufactured adhering to well-known safety regulations. Customers can Request for a Quote, Request for a Sample, or Place an Order. If you have any queries, please feel free to contact us. Copyright © 2017 all rights reserved.Performance Label Co.